Our 19’ Red ShockStrap is made of 1” red Polyester webbing, 3/8” steel hooks, a proprietary formula to make ShockStrap and our cam buckle with aggressive teeth to bite into the webbing. The 1” Polyester webbing has a 3800 lb breaking strength and 500 lb working load limit. Polyester webbing is superior to Polypropylene webbing and stretches less, is more resistant to rot and mildew, has a higher strength rating and a softer feel in your hands. The ShockStrap Hooks are made of 3/8” steel with yellow zinc chromate finish, which offers better weather resistance and durability compared to standard chrome plating. The hooks have a wider opening to allow for more connection options compared to the smaller hooks of other tie-downs. The cam buckle is rated over 1800 lbs and is also yellow zinc chromate coated. The ShockStrap is made from a proprietary formula and is not affected by most chemicals, sunlight, oil, salt water, fungus or moisture. 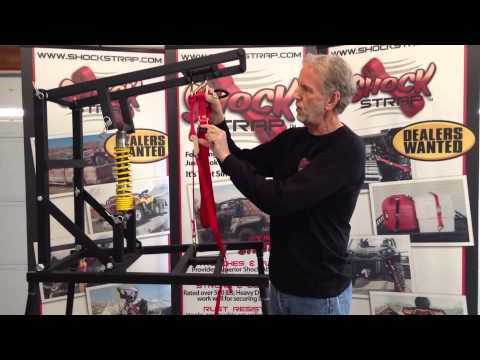 The ShockStrap has a 500 lb strength rating. The goal of our product is to make everything work together so that the ShockStrap stretches and flexes back into shape after hitting bumps or having side pressure on it. Here is an example of using a shockstrap that is great! Because the liftgate vibrates a lot going down, it is imperative we have a secure grip that also eliminates some of the strain on the strapping and won’t snap. Use of this on a liftgate is a safety issue as well as securing the cargo. As info, it is our company policy that when lowering or raising a shipment that is tall or questionable on a liftgate, drivers are required to strap it on. So this fits our need to comply with policy too! I just wanted to let you know, that I was in a bad situation just the other day and broke down on the side of the road. I didn’t have a chain to tow my car home with, but I did have my Shock Straps. I know that this is not the recommended use for the straps but, I did use them to tow the car and there is not any damage to them at all. Shock Strap saved the day! provides just the right amount of “give” not to damage the valuable cargo. products we use. Shock strap is simply the best on the market today. I have been using these in our delivery trucks for Bill’s Ace Hardware for many years. These straps have saved many BBQ’s from heavy traffic. The quality is fantastic and we have never had a failure.